The bars look and taste somewhat like compressed blocks of birdseed. Ingredients such as sea salt, goji berries, macadamia nuts, raw honey, and, of course, many types of seeds — flax, pumpkin, sesame, sunflower — make for a grainy texture that is nutty and rough on the tongue. Raw Crunch bars, the product of a small North Carolina company called Body Engineering Inc., are the latest in a pool of strange energy foods I have put to the test. Touted to contain “no artificial nothin’,” the bars are said to be uncooked, unprocessed, enzyme-rich, and made batch by batch each day in a kitchen by hand. 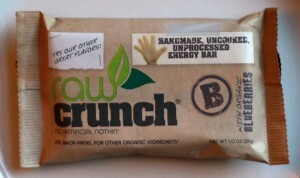 Six years ago, with a goal to create a new type of energy bar, the founders of the company (www.rawcrunchbar.com) set upon a singular and humble objective: To make a bar with a full list of ingredients “we could actually pronounce.” The first bars were baked in a home kitchen, packaged in Saran Wrap, and sold to friends. Today, Body Engineering has a line of bars that come in flavors like blueberry, cranberry, goji, and dark chocolate. They are dehydrated rather than cooked and have a five-month life on the shelf. The company says the dehydrating process does not manipulate the natural enzymes and antioxidants found in the constitutes of the bars’ ingredients. I taste-tested the company’s line and came away liking the bars quite a bit. 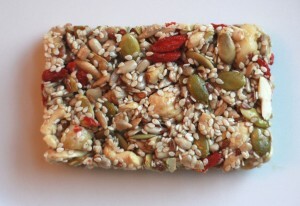 These are not your normal sweet energy bars, nor do they taste like granola. The goji berry flavor is semisweet and nutty but with the hint of a grassy taste underneath and tinged slightly with sea salt. Raw Crunch bars, which cost about $2.50 apiece, are grainy and seedy, and they have that simple “healthy” taste I associate with raw bulk ingredients and co-op grocery stores. They contain about 150 calories per bar with 10 grams of fat and a bit of protein. For outdoors activity, these bars are best used in the “meal-replacement” category, rather than for quick energy. Eat them in place of a PowerBar, gorp or other filling, on-the-go food. As an alternative to more-processed energy bars — or, even better, as a stand in for candy — the Raw Crunch bars are a healthy option that should not disappoint. The sweet, salty, nutty taste is unique. Just try to forget you’re eating something that looks like birdseed when you take that first bite.